Beijing locals know the building that houses China’s state-run television station by its affectionate nickname: “Big Pants.” From certain angles, the skyscraper resembles a pair of shiny silver trousers straddling the capital city. Architecture fans the world over recognize the structure, too. The building, properly known as CCTV Headquarters, and its architect, the maverick Dutchman Rem Koolhaas, took home top honors Thursday night from the Chicago-based Council on Tall Buildings and Urban Habitat. The 768-foot-tall building became an instant icon when it was completed in 2012. CCTV had to stand out, Koolhaas told an audience of nearly 600 council delegates Thursday, because Beijing’s ongoing building boom could mean an excess of 300 skyscrapers in the next few decades. “It didn’t make sense to do a needle or to go for height,” Koolhaas said. Instead, he and his team at the Rotterdam-based Office for Metropolitan Architecture created an unpredictable geometric loop that shifts at every angle. From some vantage points it looks like a sleek glass “Z.” From others, it resembles a towering, angular Mobius strip. Koolhaas said the building’s most well known view was his least favorite, and that the structure’s unpredictability was its greatest achievement. 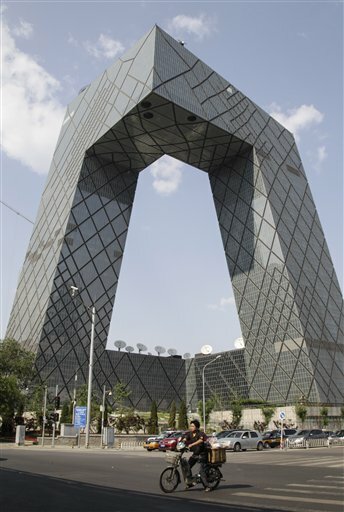 “Its versatility is its most modern contribution to Beijing,” he said. Koolhaas won the Pritzker Architecture Prize, sometimes called architecture’s Nobel Prize, in 2000. His other buildings include Seattle’s Central Library, Portugal’s Casa da Musica concert hall and the McCormick Tribune Campus Center at the Illinois Institute of Technology. The Bow in Calgary was so named for its shape, which is something akin to a cross-section of celery stalk. British architects Foster + Partners clustered core uses in the center and surrounded each floor with small offices, giving cubicle-dwellers access to a stunning view of the Rocky Mountains. Sowwah Square, the home of Abu Dhabi’s regional securities exchange, features climate control measures like a double-paned exterior glass wall that helps cool and recirculate air, and blinds that raise and lower automatically depending on the time of day and the angle of the sun, to manage temperatures that can be in excess of 115 degrees. The Council on Tall Buildings is the world’s arbiter of official skyscraper height, and also conducts research on sustainable building practices. The group also gave awards Thursday for innovation and lifetime achievement. Innovation awards went to Kone Corp., a Finnish company that created a super strong, lightweight carbon-fiber rope they hope will replace traditional steel cables in high-rise elevators, and the BROAD Group, a Chinese company that has developed a modular building system that enables construction workers to snap one pre-fabricated piece into the next, almost like Legos. Henry Cobb, a founding partner along with I.M. Pei of the international architecture firm Pei Cobb Freed & Partners, took home one of two lifetime achievement awards. The other went to Chicago geotechnical engineer Clyde N. Baker Jr., who had a hand in designing the foundations of seven of the world’s 16 tallest buildings. Baker, who retired from the Chicago offices of AECOM in July, discussed his work on the foundations of buildings ranging from the Petronas Twin Towers in Kuala Lumpur to the never-built Chicago Spire. “It’s ready for a building, if someone comes up with the money,” Baker said Thursday. The Council on Tall Buildings holds its next Chicago event, a symposium on the future of cities, Feb. 14-17 at IIT.